Flexibility- Traditional panic buttons commonly offered through alarm companies require hard wiring into your phone line. So changing your office around or moving would cause a representative to move the buttons at your cost. I can’t speak for other USB Panic Buttons, but I can explain how the USB panic buttons offered through CRS operate. 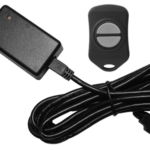 The CRS USB Panic Button is shipped to clients pre-programmed and ready to use, simply plug the device into any workstation operating CRS Notify and it automatically works. You can change the USB panic button to any other computer operating CRS Notify at any time and it will work. Rapid Notification- Unlike traditional panic buttons, the USB panic button commonly operates with a software program installed on the computer and uses the power of the internet. As an incident response instructor, I advise clients to have an incident response plan to account for seven minutes between the onset of an incident until responders arrive. Most of that time is because most traditional panic buttons take over two minutes to alert just one type of responder. In contrast, USB panic buttons using the power of the internet result in instantaneous to seconds to alert both internal and external responders. Alerting Methods- Unlike traditional panic buttons, USB panic buttons have multiple methods to alert multiple parties. Traditional panic buttons only alert one responder of an emergency. How do we alert everyone else? USB panic buttons can simultaneously alert multiple responders and staff using multiple methods, including automated voice calls, text messages, phone apps, emails, and computers. USB panic buttons merge all alerting needs into one button for a prepared response. Location Identification- When I policed, I commonly responded to initiated traditional panic buttons. I only had the information that a panic button was initiated at that address and that was it. I did not know who initiated the panic button, their specific location, how long ago they initiated the device. The lack of information negatively impacted a solid response. I cannot speak for other organizations offering a USB panic button, only CRS. CRS USB panic buttons let each user for each location to have customizable messages for each button and each user. The messages can relay a specific message to computer, text, email, and voice call recipients to the exact location and the party who initiated the alert. The details help responders pinpoint the duress location to help effectively respond. Different Alert Levels- Again, I cannot speak for other USB panic button companies, I can only speak about CRS Notify. The USB panic buttons are optional and can operate high or low level alerts in addition to a computer mouse. Using the USB panic button, a client can determine alert levels for each button. This means that you can have a low level alert to help mitigate a problem before it escalates. You can program the low level alert button to alert needed responders using any method without alerting everyone. The low level is great for suspicious activity that business managers can handle without causing any additional or unneeded panic to everyone. Traditional panic buttons only have one method to one responder and are no longer competitive with technology today. I did not write this blog to sell CRS to you. There are many other reasons why USB panic buttons triumph over traditional panic buttons. Whether you look at CRS or another company, based on my years of experience, I ask you to refrain from traditional panic buttons. Please feel free to contact me at info@communityresponsesystems.com if you have any questions.